to get rid of these parasites." 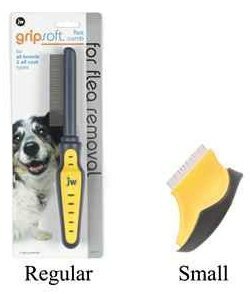 Flea combing can be done with a fine-toothed metal comb that traps the fleas and makes it easy to get rid of them. When you comb your cat, you should do it gently and thoroughly. Groom as many areas of your cat or kitten as she will allow. It's especially best to groom around the head, neck, back and hindquarters. These parasites tend to gather in these areas the most. If you have a kitten, it's a good idea to start while she's young. This will get her used to the process and she may even enjoy it! If your cat or kitten already has fleas, you should comb him at least once a day, preferably twice. If your kitty doesn't have fleas (as far as you know! ), once a week or even monthly should be fine. The frequency will depend on the time of year and the climate you live in. If it's approaching flea season, then you may want to care for your cat more frequently. The earlier you find these obnoxious parasites, the greater likelihood of preventing serious flea infestations of your cat and your home. When combing your cat or kitten for fleas, have a bowl of soapy water next to you. Start running the flea comb through your cat's fur, especially at the base of the tail and on the neck. When you see a flea caught in the comb, push the flea out of the comb with a fingernail and into the soapy water. If you don't want to touch the flea, you can put the whole comb into the water. This works very well to keep them from escaping and it sends the flea on to its next life. When you are finished, flush the soapy water and fleas down the toilet. In all likelihood, this will not be the one and only method that eliminates all the fleas from your cat and your home. You'll most likely need to choose an additional method of flea control, as well. However, getting even one of these dangerous parasites off of your cat will make her more comfortable and could prevent an infestation and other problems from occurring. A single flea can cause tapeworm and lead to flea allergies. Combing your cat for fleas should be a regular part of taking care of your cat's health. Natural Flea Control Methods This pages gives you more info on safely and effectively getting rid of these parasites.